On Monday Reel-Time Bars set up a V.I.P Cocktail Bar as a reception for the VOWS Awards (Voted Outstanding Wedding Supplier). 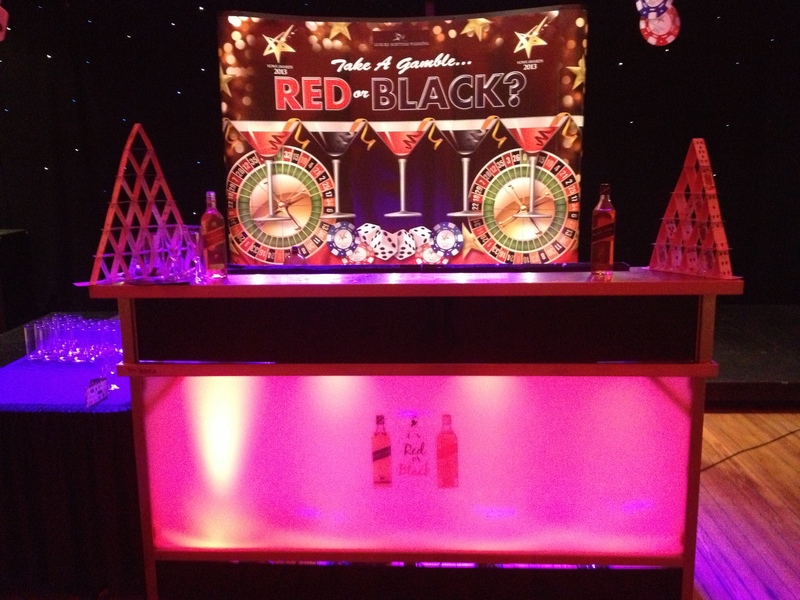 Held in the Edinburgh Corn Exchange the VOWS Awards followed a Vegas casino theme; Mark and his team set up a Pop-Up Bar with a red and black façade. Serving over 250 guests the Cocktail Bar was busy for the nominees and sponsors drinks reception; Mark and his four friendly bar staff were on hand to keep guests entertained. Guests in typical roulette style were given two choices: Red or Black. Sponsored by Diageo. Red: Johnnie Walker Red Label. Aromatic bitters, fresh lime juice, churned over crushed ice and topped with ginger beer with a garnish of mint. Black: Johnnie Walker Black Label. Fresh pineapple, fresh lime juice, vanilla syrup, fresh orange juice, churned over crushed ice and garnished with a pineapple leaf and orange slice. The evening was a great success bringing together Scottish wedding suppliers and assembled ‘glitterati’ from all across Scotland to congratulate industry leaders and innovators. We would like to congratulate all winners who picked up a coveted Scottish wedding industry Award last night. Reel-Time Bars would like to thank the VOWS organisers and the events team at The Corn Exchange for helping to create a memorable evening.